Follow us to some of the most scenic Upstate New York Getaways this time. Some of the country’s most gorgeous and relaxing destinations are situated in upstate NY, just minutes or a few hours away from New York City by train or car. New York is more than the skyscrapers and bustle of a metropolitan city, there is a lot more to the state than just the city. 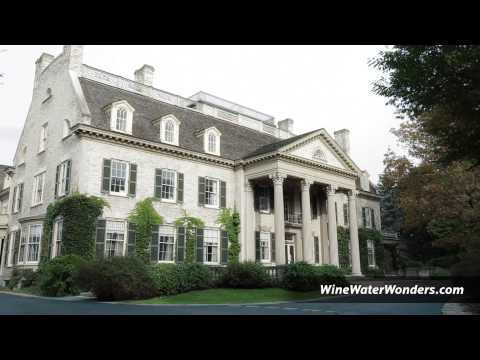 #1 Incredible Upstate New York getaways in the Finger Lakes wine country. The Finger Lakes region near Syracuse and Rochester offers opportunities to indulge in both wineries and lakes. The lakes were formed by departing glaciers at the end of the last ice age and are a beautiful sight. During the summer months you can go boating, swimming and do water sports, while the surrounding nature is ideal for hiking and mountain biking. But the Finger Lakes region also is increasingly known for its wineries. Taste and tour the region on five trails. Seneca Lake is the largest of The Finger Lakes and has the most wineries. At Seneca Lake Wine trail both Lakewood and Wagner Vineyards are not to be missed. But the area boasts a number of breweries and several cider producers too. From small cascades to high drops – the Finger Lakes region of New York State is dotted with waterfalls across its landscape. Many of these falls are located within the state parks, others can simply be seen while driving around. quote>Enjoy foliage, hikes, shops, and food on upstate New York getaways. If you look for shopping options on your trip, the majority of the towns in the Finger Lakes have pleasant downtown cores with cute, charming and unique shops. #2 A beauty like Niagara Falls is never out of season. A summertime ride on the “Maid of the Mist” takes you underneath the Falls, where you will get up close. Luckily, waterproof rain-gear is provided, because you will get wet. In winter, you better opt for the Journey Behind the Falls experience instead, it’s a lot drier. Bring your passport and take an international walk across the Rainbow Bridge to the Canadian side of the falls. There are lots of hotel choices in town, but do yourself a favor and check out these Niagara Falls Special Deals and Offers first. Don´t miss the night illumination show when it gets dark, it provides a stunning romantic spectacle. The firework display over the falls each Wed. Fri. and Sun. night at 10pm (May 1 through October 31) is another highlight. Family tip: the Aquarium of Niagara is probably the most worthwhile stop, kids love the cute penguins and seals. #3 A good deal of Upstate New York falls within the Adirondack Park, an area larger than Yosemite, Yellowstone or the Grand Canyon. It includes the Adirondack Mountains and hundreds of lakes and streams. The Adirondack mountains in upper New York offer 6 million acres – just waiting to be explored. Although three are no large cities exist within its borders, there are some restaurants and lodging in the many towns and villages scattered throughout the Adirondack Park. Go for upstate New York getaways and enjoy a break from monotonous days. #4 The beautiful scenic shores of Lake Placid is one of the perfect upstate New York getaways. A romantic spot for couples on their honeymoon, or for anyone who want to pop the question. If you're visiting Lake Placid, this is the place to stay: Lake Placid Lodge - outstanding in all ways. Indeed a wonderful place for couples wishing to get away for some relaxing quality time together. Whether you visit in winter or summer, there is always something to do. Winter can have you participating in a dog sled ride, skiing or ice fishing. Summer upstate New York getaways provides opportunity for hiking, boating, playing golf, fishing, horseback riding or tennis. For the couples, you can take a canoe out to a private island for a leisurely day alone together. For those who want to cozy up inside, the cabins offer working fireplaces, in-room modem links and a wet bar. The tubs are large and perfect for a nice long hot bubble bath. Be sure the staff here will gladly help make this the most memorable experience of a lifetime. While all the cabins are spectacular, one stands above the rest. Owl’s Head is a very special cabin. Set just a step or two from the edge of the lake, the cabin’s private porch is fringed by a small, tumbling brook. Exceptional romantic upstate New York getaways awaits you. The room has a vast hand-crafted stone fireplace and a king-size feather-bed shaped from a tree. In the vast bathroom, there is a two-person Jacuzzi jet tub, a dry sauna, and a six-headed steam shower. This spacious, one-room suite is the most luxurious and one of the romantic Upstate New York getaways. Have a relaxing weekend getaway in upstate New York! #5 Along the St. Lawrence Seaway, at the boarder to Canada, stretches the Thousand Islands region. The area features everything from river cruises, private boating, festivals, lodging, restaurants and lovely shops in its villages and cities. You can take kayak trips along the waterways, participate in guided diving tours, or visit historic sites. Visit Boldt Castle, a must do if you’re in the 1000 islands. As I visited Boldt Castle years ago it was in a terrible state of disrepair. But now large parts of the castle have been lovingly and painstakingly restored and repair is still ongoing. The landscaped garden is a great spot for a picnic in summer or fall. Hope you enjoyed our tips for Upstate New York getaways, stay tuned for more exciting destinations.